For me, it all begins with Django Reinhardt, arguably the first and greatest jazz guitarist of all. He played Selmer guitars which, with their loud clear voice, gave Django the perfect instrument for his many compositions, performances and recordings. Django was the most popular jazz musican in Europe for over ten years and his style gave birth to a genre known now as Gypsy Jazz. This popularity gave rise to many versions of the original Henri Selmer guitar. In the 40s and 50s, Italian luthiers imigrated to Paris to build variations on the Selmer theme. Busato, Dimauro, Castelluccia, Favino among others. Each had their own take on the famous Selmer guitar. Collectively, these are know as gypsy or manouche (French Roma) guitars. 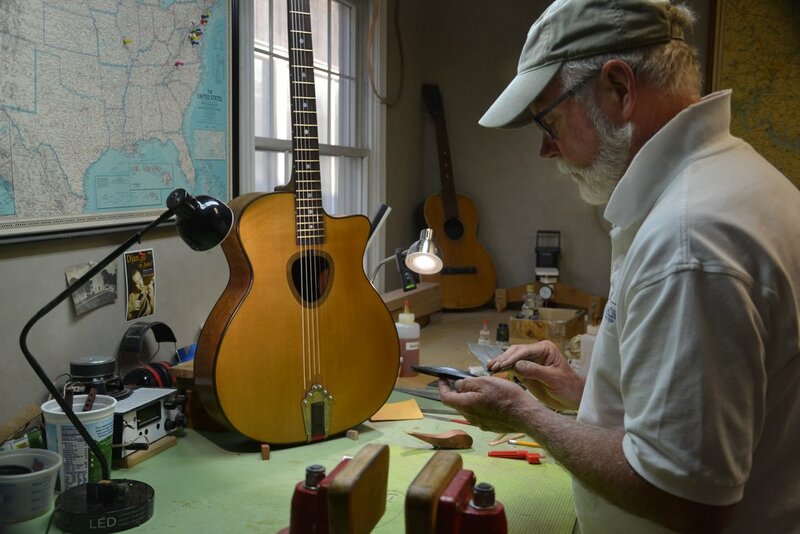 I build handmade gypsy guitars, one at a time, in Drayden, Maryland. I've had the good fortune to study many vintage guitars from the 40s and 50s as well as modern guitars in style. From these I have forged my own models, each with distinctive characteristics. I strive for tonal qualities and volume that distinguish these guitars and which modern players seek and enjoy. Responsiveness and clarity are primary goals. I try to build the most playable, durable and aesthetically pleasing instrument, continually trying to improve. I'm a player as well. I played with the Hot Club of DC for many years and currently play guitar with Les Zazous Trio.